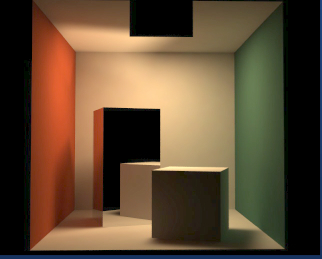 The left image was captured from a physical model under controlled lighting conditions using a Photometrics CCD camera. 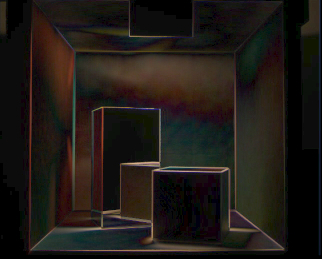 The right image was rendered using a geometric model with material properties and lighting set to values identical to the physical conditions. The 'difference' image below is simply a pixel-by-pixel subtraction of one image from the other. Some discrepancies can be seen in the shadowing on large surfaces due to the meshing used in the rendering software. Edge effects stem from misregistration between the actual positions and dimensions of the physical objects and the coordinates used for rendering. 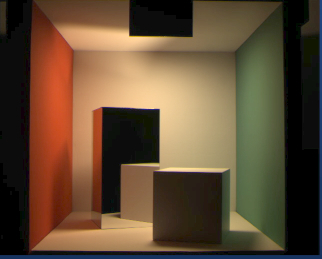 Comparisons such as these rely on the resources of the Cornell Program of Computer Graphics' light measurement laboratory.